How do you know if your horse needs body work? A good way to tell, but not limited to, is observe your horses tracking up at the walk. You may need someone to lead your horse out for you so you can concentrate on what the legs are doing! The hind hoof print should track/land directly on the front hoof print as they are moving forward in an active walk. The print should be square into the front one. If the print is behind or in front of the front track usually this indicates muscular, whilst if the track is medial (to the inside) or lateral (to the outside) of the front print, then this generally indicates structural work is need i.e. : Chiropractic, but not always. Another good tip is if your horse is wearing its hind toes square naturally - it more than likely needs its pelvis or hips addressed by a chiropractor. Happy observing!! 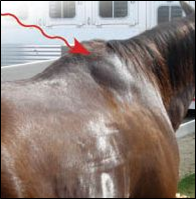 What Causes Rotated Scapula In The Horse? The #1 cause of rotated scapula in the horse is a narrow saddle. When the saddle is too narrow, the scapula/s get pinched by the tree of the saddle, causing great pain for the horse. As the horse's forelimb moves upward, forward and backward, the scapula moves back and forth as well. When the horse's leg comes up as when jumping or cantering, the scapula can move backward by 4 or 5 inches. The horse is forced to rotate the scapula forward in an attempt to move away from the pain. Most people have seen horses with white spots on either side of the withers. This is caused where the saddle is rubbing against the scapula as it moves back to that position. Rotated scapula can greatly affect your horse's performance and prevent full extension of the foreleg. Hunch your own shoulders up and forward and then try swinging your arms forwards and backwards. Very awkward isn't it? Now try the same thing with your shoulders back in a normal position. It makes a big difference in your range of motion. Even after the underlying cause of the problem has been addressed, your horse may need a little extra help in putting things back where they belong. A series of rehabilitation Bowen treatments will aid in this muscle returning to balance along with a simple stretch in between sessions. Another thing that can cause rotated scapula in the horse is a very upright hoof. Too much heel on the horse is like putting on high heels in the human. The horse is forced to stand on its tippy-toes, forcing the scapula forward to accommodate the position of the foot/leg angle. Some horses have only one side rotated forward. This can be caused by the ribcage being held to one side, either habitually, due to injury or misalignment or from training that dominants one lead preference. A very simple and easy stretch you can do with your horse to help improve a rotated scapula is to lead your horse by the leg. (pictured below). The leg position for this exercise is almost identical to one of the stretches used to help rotated scapula. 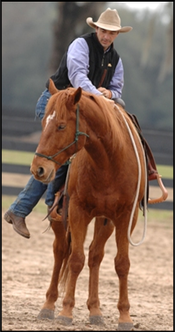 It's a great way to teach your horse to follow a feel, trust your hands and stretch all at the same time. The key to this stretch is bringing the leg out about 45 degrees while stretching the leg and shoulder at the same time. You want your horse to really reach into the stretch for about 20-30 seconds, then it's important to get them to actually take a step and put weight on the leg in question. Try this simple stretch about 3 or 4 times per week for 30 days and see the difference. goal of lateral flexion is to be able to slide your hand down the rein and, with the lightest amount of pressure, ask your horse to bend his head and neck around to the side. Your horse should be so soft and supple that you can get him to bend and soften by only sliding your thumb and index finger down the rein. A lot of people who have dabbled in horsemanship will probably be familiar with Lateral Flexion. However, are you asking for lateral flexion correctly and are you releasing when your horse is in the correct position? Many people have been taught to flex their horses nose around to their foot (myself included) and whilst this has its place and can be perhaps rewarded when initially teaching a horse to laterally flex if they are new to it, it is however not ideal. You need to ensure that your horse is truly flexing laterally and this comes from the poll, not the neck. 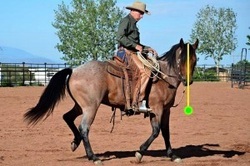 A quick way to check, are your horses ears level throughout the exercise? If they aren’t your horse is not breaking at the poll but rather using his neck to flex. Some horses may be good at flexing one way, but not so good the other. (If your horse really struggles with this it may pay to get him checked out structurally and soft tissue as there maybe some body misalignment or tightness which is hindering him). 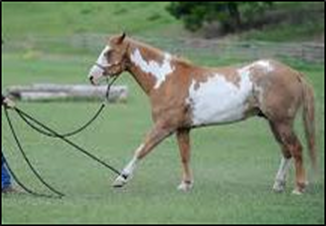 Does your horse stand still when you get on and off? 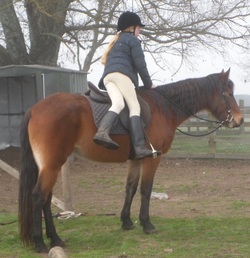 One of my absolute annoyances is a horse that walks off whilst you are mounting up or straight after getting on. Not only is it disrespectful it’s actually potentially very dangerous. However, we can not blame the horse in this habit, it has been taught that this is the norm and is okay. We humans always tend to be in a hurry to go some place when we get on our horse rather than taking a couple of moments to put a good wait on our horse and to collect your own thoughts and perhaps to take some breaths to unclench the pucker factor if you are a bit nervous or worried. I personally had such a huge issue with mounting when I first started out with my main horse Mine - I could not get on her from the ground and I definitely could not get on from the off side. My instructor at the time gave me the tools to deal with this to take it right back to desensitizing Mine which clearly had been missed in her starting process. We spent a lot of time on this including the off side and finally mastered the art of mounting and dismounting on both sides. I encourage everyone to be proficient at mounting and dismounting on both sides, not only is it good for your horses development, its great for your own muscular strength, evenness and balance, it is much better on your horses back and also keeps your stirrups/fenders the same length on both sides—no more annoying one stirrup longer than the other! Why is it popular to get on your horse on the left side? It stems from military days when soldiers carried swords—the swords would hang to the left so you got on your mount from the left, unless you were a leftie then you would mount on the right as your sword would be to your right. This historical tradition has come down through the English horse training evolution. · Don’t be in a rush - take the time that it takes to set it up for success & practice makes perfect! · Only get on if your horses feet are still and he is calm and relaxed, hint look at his eye—is it soft and blinking or starry and not blinking? If you are having trouble with any of this, give me a bell to problem solve. With my learning and growth over the past 6 months, my most valuable lesson has been involved in Mine’s shoulder and thanks to Scott’s help I have managed to get a lot better control of her shoulder which has helped everything especially our circles, turns and hip control. I thought I had a great moving of the hindquarters, but my focus was only on the hindend and not what the front end was doing at the same time. The same with the moving the forehand although the front end was soft and responsive the hip kept falling out. A lot of what I was doing with my body language and aids were causing her to be heavy and weighted on her front end. Although a lot of what I am working with Mine is asking her using her body correctly it also highlights my responsibility that my body directly effects her ability to respond to such requests. If I have a dropped shoulder, collapsed rib cage, or over weighted hip, then she will be unable to respond correctly in using her body. Our bodies must match. Balance within her body depends on balance within my own body. I have noticed a huge change in our relationship for the better with the work with the shoulder and I personally feel particularly with Mine it is a form of ’submission’ in allowing me to control her body she is giving to me mentally and emotionally. Our second area of major learning is asking for everything with a soft feel in the bridle with no leaning or bracing. Previously having done everything on a casual rein (which is important for other reasons) developing a walk, trot, canter, stop, lateral work - basically everything; with a soft feel in the bridle (image to left) has been a work in progress and we have come a long way so far and will enjoy the progress on the journey. My motto at the moment “Never release on a brace”. Give me a call if you need some help with either of these! Do you have a good go button? Can you get your horse to go using your body language or light leg aid? Do you have to kick to get your horse to go? Do you then have to keep nagging for your horse to maintain the gait you are in? Get’s frustrating doesn’t it, or maybe you don’t even realize you are doing it! Getting your horse light to your ‘go’ leg aids is easy if you know how and can be fixed pretty quickly with good timing and release. Most people don’t have a good ‘go button’ on their horse. 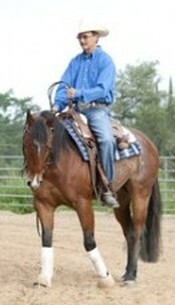 The horse should respect the pressure of your legs and promptly move off when you ask with light pressure. 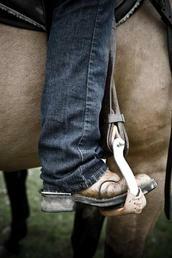 People then fall into problems when they ask with their leg/heel, horse doesn’t go, they take the pressure off (i.e. : to go to kick) and have just taught their horse not to move off of the leg pressure as you removed the ask without the desired result being achieved. The trick is to keep the pressure on until the desired gate is achieved, but you need to ensure your body is matching what you are asking and you need to be prepared to do something to reinforce your leg aid if its not working, whether it is a tap behind your leg with a training stick, a slowly building of pressure spank on the hindquarter with your reins or hand, anything along these lines will work. Work on improving your “go button” will improve any problems you may have with water crossings, bridges, ditches or any type of obstacle. Remember it is your horses responsibility to maintain gait until you ask otherwise, and it is your responsibility to not micromanage or nag your horse. If your having some problems with this and need help, contact me to arrange a one on one lesson. I have taught many a person who maybe worried, fearful, nervous or not fully have trust in their horse depending on where they are at in their journey. How often have you heard “Don’t get off, the horse has won!”. Horses don’t think like this, often we have so much pucker factor going on, that the horse thinks “Wow! My leader is worried, I should be too!”. So why stay on and make the situation worse? Get Off! Sort it out on the ground, sort yourself out on the ground and then start again. It is not wrong to get off, its not a failure to get off, in fact sometimes its the thing that will save your life! If your thinking something is going to happen, bets are on, that it will! Somehow we think that getting on and staying on will make the fear/nervousness go away, or it will build confidence. But it doesn’t. Fear builds by staying in the place where you feel it. Just like horses, you have to be able to get away and then re-approach the situation as often as it takes until you feel nothing. The sensation of fear can be butterflies, tension, adrenaline, visions of terror/accidents, terrifying self talk etc. The secret is retreat. You have to know that at any time you feel unpleasant fear related sensations you can back away from them. As soon as you do notice that the feelings subside. You feel better immediately. Safe. It’s the same for your horse! Advance & Retreat! If your experiencing problems that you think are fear based, I can help and support you through this with my one on one private lessons. Above Photo: One of my young students practising mounting and dismounting, a great way to build confidence in an advance and retreat exercise.